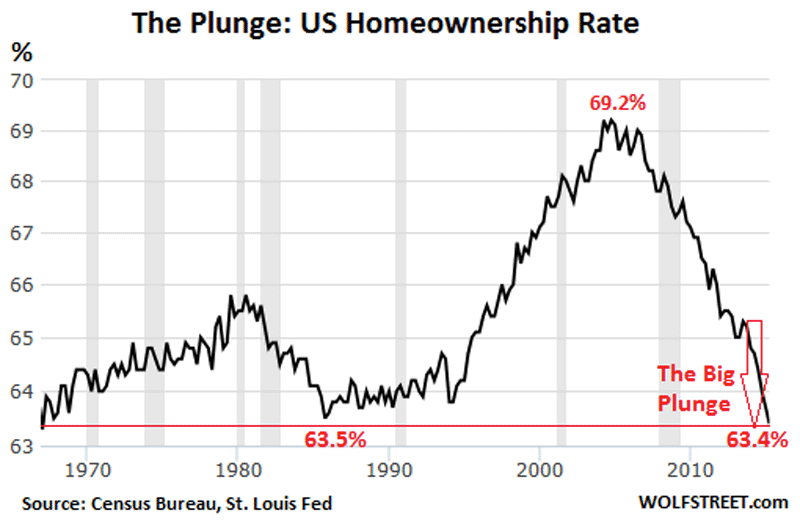 But despite the current “buying panic,” the soaring prices, and all the hoopla round them, there is a fly in the ointment: overall home ownership is plunging. The home ownership rate dropped to 63.4% in the second quarter, not seasonally adjusted, according to a new report by the Census Bureau, down 1.3 percentage points from a year ago. The lowest since 1967! The process has been accelerating, instead of slowing down. The 1.2 percentage point plunge in 2014 was the largest annual drop in the history of the data series going back to 1965. And this year is on track to match this record: the drop over the first two quarters so far amounts to 0.6 percentage points. This accelerated drop in home ownership rates coincides with a sharp increase in home prices. Go figure. 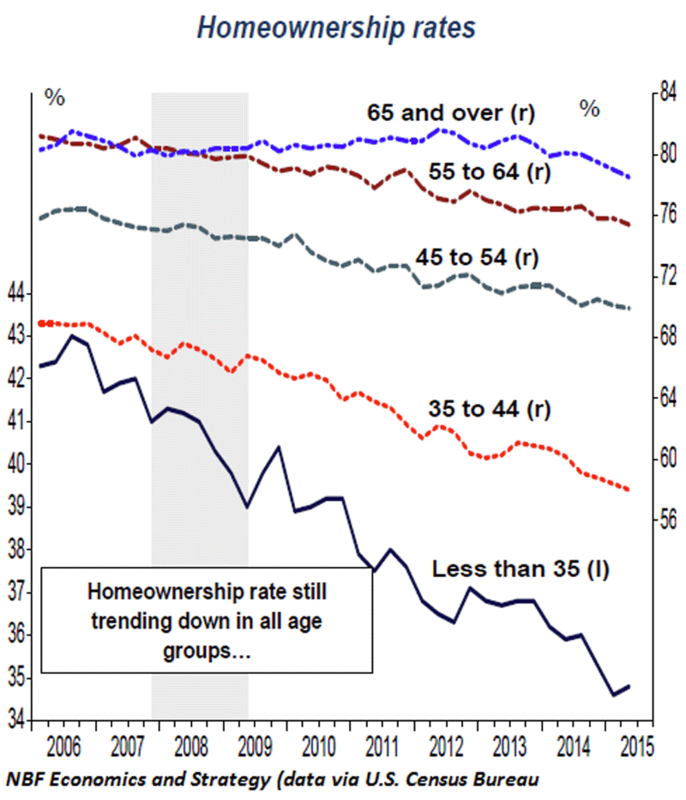 The plunge in home ownership rates has spread across all age groups, but to differing degrees. Younger households have been hit the hardest. In the age group under 35, the home ownership rate in Q2 saw a slight uptick to 34.8%, from the dismal record low of 34.6% in the prior quarter. Either a feeble ray of hope or just one of the brief upticks, as in the past, to be succeeded by more down ticks on the way to lower lows. This chart shows the dynamics between home ownership rates (black line, left scale) and rental vacancy rates (red line, right scale) over time: they essentially rise and dive together. 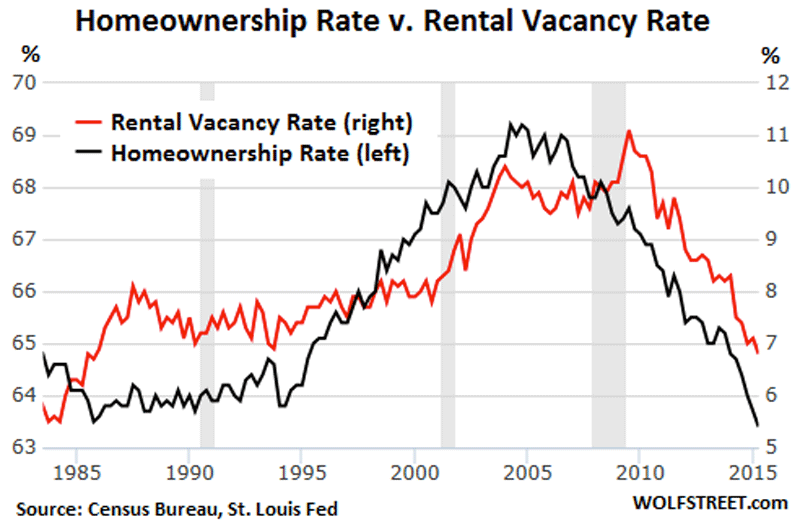 It makes sense on an intuitive basis: as people abandon the idea of owning a home, they turn into renters, and the rental market tightens up, and vacancy rates decline. This entry was posted in Housing, Housing Market, Real Estate, Retail Sales, Uncategorized and tagged America, California Assn. 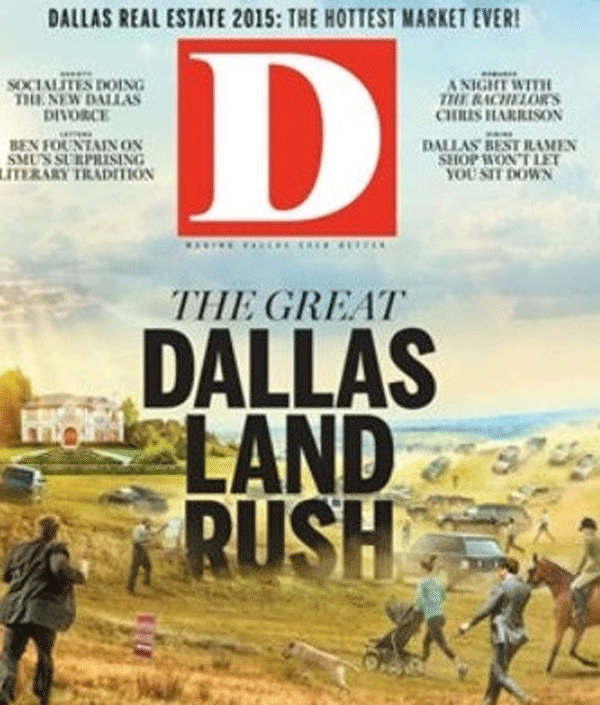 of Realtors, Dallas, housing bubble, housing market, Midland Texas, Mortgage Bankers Association, National Association of Realtors on July 30, 2015 by Bone Fish. Economists said those factors put the regional housing market on a path for growth that won’t wash away in a tsunami of foreclosures and ruined credit scores. “The healing continues,” said Stuart Gabriel, director of UCLA’s Ziman Center for Real Estate. On Thursday, fresh evidence of that trend emerged in a report from CoreLogic. Home sales posted a sizable 18.1% pop in June from a year earlier, while the median price rose 5.7% from June 2014 to $442,000, the real estate data firm said. Sustained job growth has given more people the confidence to buy houses, CoreLogic analyst Andrew LePage said. California added a robust 54,200 jobs in May, one of the strongest showings in the last year. In response, families rushed to lock in historically low rates this spring, agents say. CoreLogic’s sales figures represent closed deals, meaning most went into escrow during May. Leslie Appleton-Young, chief economist for the California Association of Realtors, cautioned that the market still has too few homes for sale and that prices have risen to a point where many can’t afford a house. Unless that changes, sales are unlikely to reach levels in line with historical norms, she said. “I am not saying the housing market isn’t robust,” she said. Sales and prices climbed in all six south land counties: Los Angeles, Orange, Riverside, San Bernardino, San Diego and Ventura. In Orange County, the median price rose 4.9% from a year earlier to $629,500. In Los Angeles County, prices climbed 8.7% to $500,000. This entry was posted in Housing Market, Real Estate, Uncategorized and tagged California, California Assn. 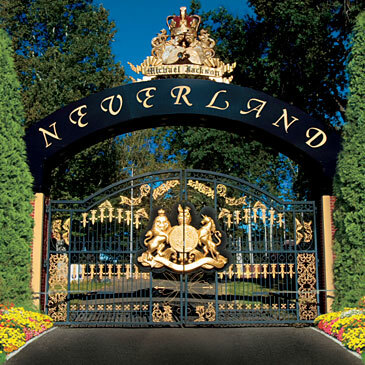 of Realtors, CoreLogic, Home Sales, housing market, Mortgage Bankers Association, National Association of Realtors, SoCal on July 17, 2015 by Bone Fish. Back in March, PropertyRadar’s report showed California was finally ramping up for the spring homebuying season, posting that March single-family home and condominium sales surged to 31,989, a 33.1% jump from 24,031 in February. It was the biggest March increase in three years. Meanwhile, May’s median price of a California home was nearly unchanged at $396,750 in May, down 1.8% from $404,000 in April. This entry was posted in Real Estate, Uncategorized and tagged Californai, California Assn. of Realtors, housing market, Mortgage Bankers Association, National Association of Realtors, real estate on July 1, 2015 by Bone Fish. Landlords in Venice and other tourist-friendly areas are converting units into short-term rentals, worsening the area’s housing shortage, a study says. About 12,700 rental units were listed on Airbnb in Los Angeles County on Dec. 22, 2014, but they were not spread out equally. In parts of Venice and Hollywood, Airbnb listings accounted for 4% or more of all housing units. But there are growing signs of professionalization of the short-term rental world, from property-manager middlemen like the one who e-mailed LaFlamme to Airbnb “hosts” who list dozens of properties on the site. The Los Angeles Alliance study estimates that 35% of Airbnb revenue in Southern California comes from people who list more than one unit. City Council member Mike Bonin, whose coastal district includes Venice, and Council President Herb Wesson want to study how these rentals have affected the city. No regulations have been drafted, and Bonin said the council would seek extensive community input. Current rules bar short-term rentals in many residential areas of the city, but critics say they’re rarely enforced. As city officials craft new ones, they’ll certainly be hearing from Airbnb and its allies. Last year, the company spent more than $100,000 lobbying City Hall and released a study touting its economic impact in L.A. — more than $200 million in spending by guests, supporting an estimated 2,600 jobs. A group representing short-term rental hosts has made the rounds of City Council offices as well. Neighborhood groups are sure to weigh in too, especially in Venice. The beach neighborhood has the highest concentration of Airbnb listings in all of metro Los Angeles. Data collected by Beyond Pricing, a San Francisco-based start-up that helps short-term rental hosts optimize pricing, show that in census tracts along Venice Beach and Abbott-Kinney Boulevard, Airbnb listings accounted for 6% to 7% of all housing units — about 10 times the countywide average. 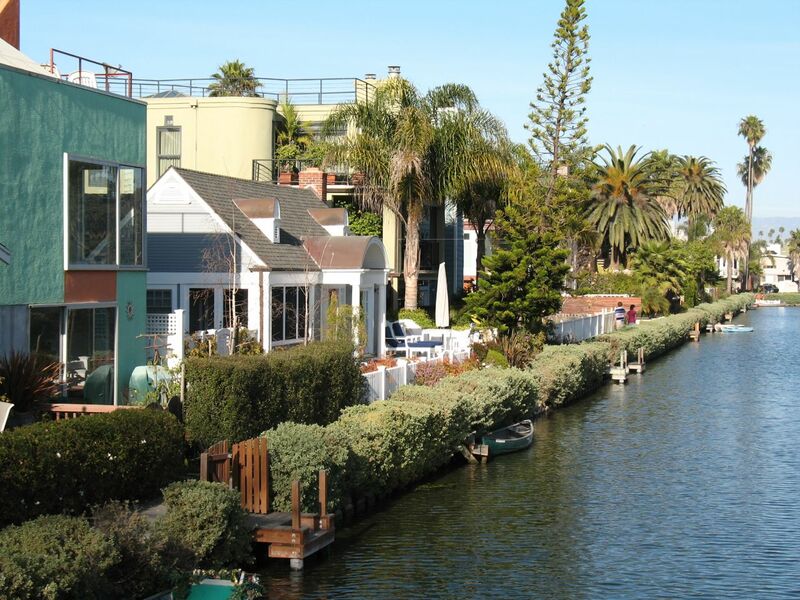 A letter last fall from the Venice Neighborhood Council to city officials estimated that the number of short-term rental listings in the area had tripled in a year, citing a “Gold Rush mentality” among investors looking for a piece of the action. That’s hurting local renters, said Steve Clare, executive director of Venice Community Housing. 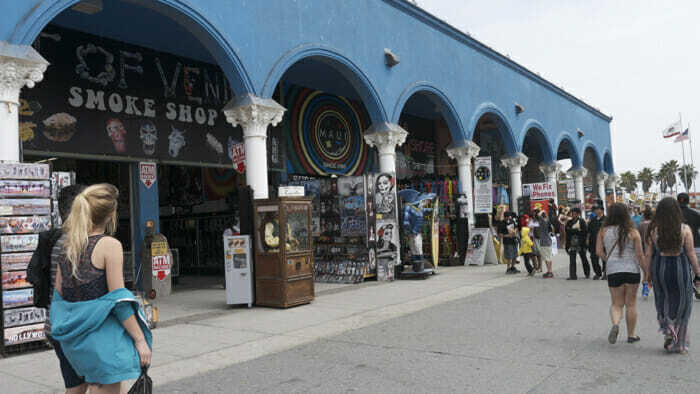 Along the Venice boardwalk, a number of apartment buildings now advertise short-term rentals, and houses on the city’s famed “walk streets” routinely show up in searches on Airbnb. Even several blocks inland, at Lincoln Place Apartments — a 696-unit, newly renovated complex that includes a pool, gym and other tourist-friendly amenities — Roman Barrett recently counted more than 40 listings on Airbnb and other sites. Barrett, who moved out over the issue, said Airbnb effectively drives up the rent. He paid $2,700 a month for a one-bedroom; now he’s looking farther east for something he can afford. A new law of some sort is the goal at City Hall. New York, San Francisco and Portland, Ore., have crafted regulations to govern taxes, zoning and length of stay in short-term rentals, and Airbnb says it’s glad to help in that process here. “It’s time for all of us to work together on some sensible solutions that let people share the home in which they live and contribute to their community,” spokesman Christopher Nulty said in a statement Tuesday. Will Youngblood, the man who e-mailed LaFlamme about managing his apartment in Los Feliz, says he’d also appreciate clearer rules and an easier way to pay occupancy taxes. Youngblood runs five Airbnb apartments, mostly in Hollywood. A former celebrity assistant, he’s been doing this for two years; it’s a full-time job. Most of Youngblood’s clients own their homes but travel a lot or live elsewhere. One, he rents and lists full time. He’s been looking around for another. If the city decides it doesn’t like what he’s doing, Youngblood said, he’ll go do something else. But for now, he said, it’s a good way to make some cash and meet interesting people. But he won’t meet LaFlamme. The longtime landlord concedes he “might be old-fashioned,” but he just doesn’t like the idea of strangers traipsing through his apartments. He prefers good, long-term tenants, and in L.A.’s red-hot rental market he has no problem finding them. For that apartment in Los Feliz, LaFlamme said, he found a tenant in less than 24 hours. This entry was posted in Housing, Housing Market, Luxury Homes, Luxury Housing, Real Estate, Uncategorized and tagged Airbnb, California, California Assn. of Realtors, housing market, Los Angeles, Mortgage Bankers Association, National Association of Realtors, Rental Housing, Venice, Venice California on March 17, 2015 by Bone Fish. RealtyTrac’s Q1 2015 Zombie Foreclosure Report, found that as of the end of January 2015, 142,462 homes actively in the foreclosure process had been vacated by the homeowners prior to the bank repossessing the property, representing 25 percent of all active foreclosures. 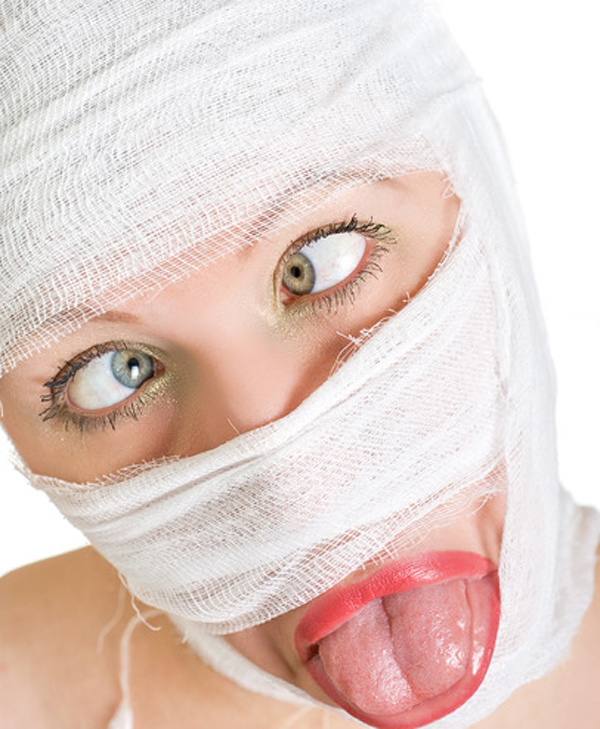 The total number of zombie foreclosures was down 6 percent from a year ago, but the 25 percent share of total foreclosures represented by zombies was up from 21 percent a year ago. Despite a 35 percent decrease in zombie foreclosures compared to a year ago, Florida had the highest number of any state with 35,903 — down from 54,908 in the first quarter of 2014. 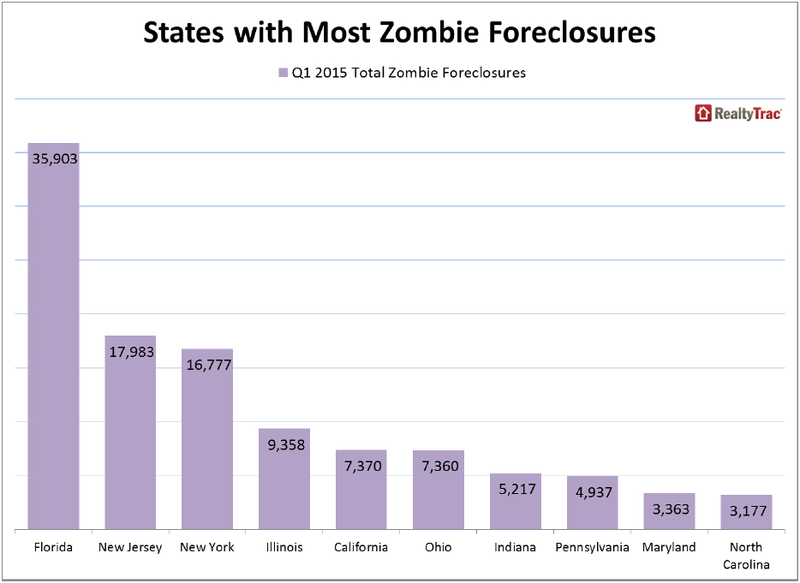 Zombie foreclosures accounted for 26 percent of all foreclosures in Florida. Zombie foreclosures increased 109 percent from a year ago in New Jersey, and the state posted the second highest total of any state with 17,983 — 23 percent of all properties in foreclosure. New York zombie foreclosures increased 54 percent from a year ago to 16,777, the third highest state total and representing 19 percent of all residential properties in foreclosure. Illinois had 9,358 zombie foreclosures at the end of January, down 40 percent from a year ago but still the fourth highest state total, while California had 7,370 zombie foreclosures at the end of January, up 24 percent from a year ago and the fifth highest state total. “We are now in the final cycle of the foreclosure crisis cleanup, in which we are witnessing a large final wave of walkaways,” said Mark Hughes, Chief Operating Officer at First Team Real Estate, covering the Southern California market. “This has created an uptick in vacated or ‘zombie’ foreclosures and the intrinsic neighborhood issues most of them create. “A much longer recovery, a largely veiled underemployment issue, and growing examples of faster bad debt forgiveness have most likely fueled this last wave of owners who have finally just walked away from their American dream,” Hughes added. Other states among the top 10 for most zombie foreclosures were Ohio (7,360), Indiana (5,217), Pennsylvania (4,937), Maryland (3,363) and North Carolina (3,177). 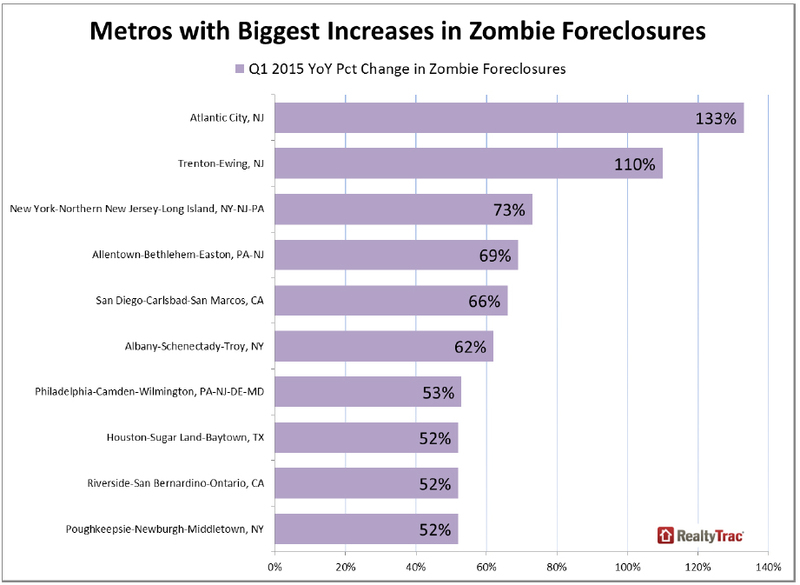 Metros with most zombie foreclosures: New York, Miami, Chicago, Tampa and Philadelphia. The greater New York metro area had by far the highest number of zombie foreclosures of any metropolitan statistical area nationwide, with 19,177 — 17 percent of all properties in foreclosure and up 73 percent from a year ago. Zombie foreclosures decreased from a year ago in Miami, Chicago and Tampa, but the three metros still posted the second, third and fourth highest number of zombie foreclosures among metro areas nationwide: Miami had 9,580 zombie foreclosures,19 percent of all foreclosures but down 34 percent from a year ago; Chicago had 8,384 zombie foreclosures, 21 percent of all foreclosures but down 35 percent from a year ago; and Tampa had 7,838 zombie foreclosures, 34 percent of all foreclosures but down 25 percent from a year ago. Zombie foreclosures increased 53 percent from a year ago in the Philadelphia metro area, giving it the fifth highest number of any metro nationwide in the first quarter of 2015. There were 7,554 zombie foreclosures in the Philadelphia metro area as of the end of January, 27 percent of all foreclosures. 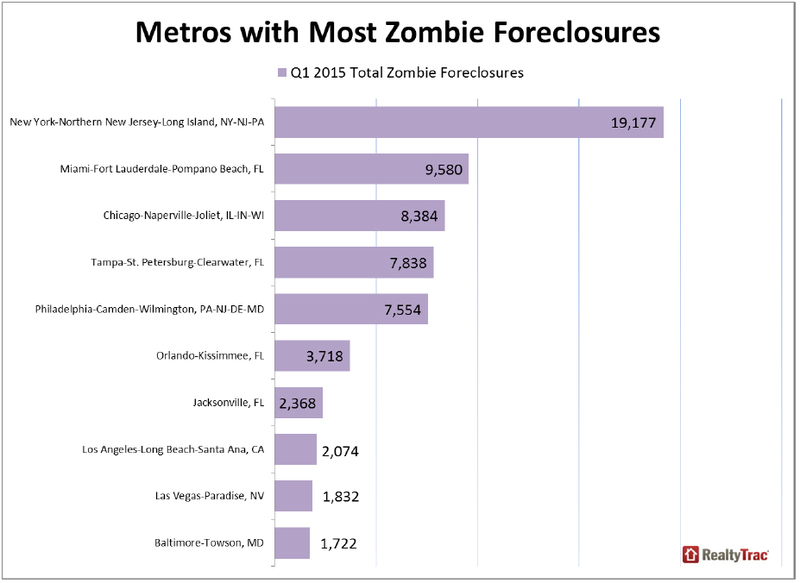 Other metro areas among the top 10 for most zombie foreclosures were Orlando (3,718), Jacksonville, Florida (2,368), Los Angeles (2,074), Las Vegas (1,832), and Baltimore, Maryland (1,722). 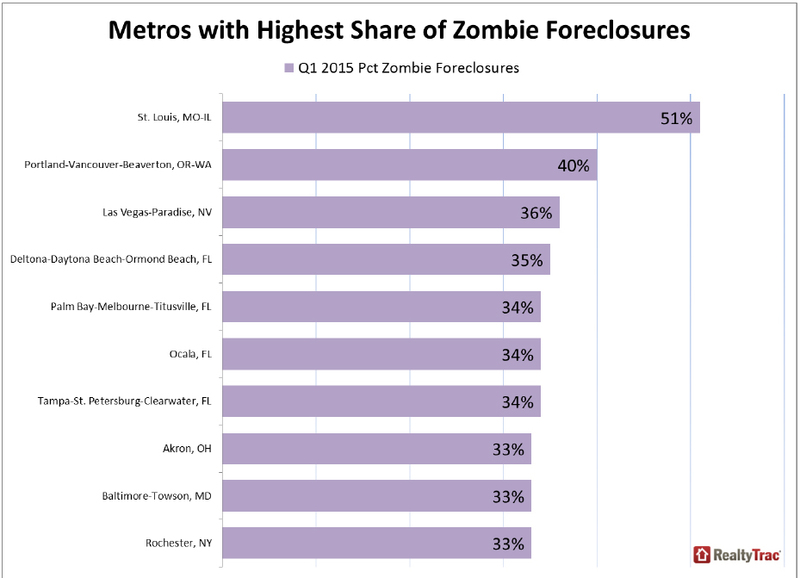 Among metro areas with a population of 200,000 or more and at least 500 zombie foreclosures as of the end of January, those with the highest share of zombie foreclosures as a percentage of all foreclosures were St. Louis (51 percent), Portland (40 percent) and Las Vegas (36 percent). Among metro areas with a population of 200,000 or more and at least 500 zombie foreclosures as of the end of January, those with the biggest year-over-year increase in zombie foreclosures were Atlantic City, New Jersey (up 133 percent), Trenton-Ewing, New Jersey (up 110 percent), and New York (up 73 percent). This entry was posted in Housing, Housing Market, Real Estate, Uncategorized and tagged America, California, California Assn. of Realtors, Fannie Mae, FHA, foreclosure, housing bubble, housing market, Mortgage Bankers Association, National Association of Realtors, real estate, Zombie on March 10, 2015 by Bone Fish.